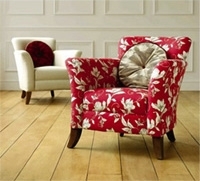 Whatever style of chair you want, whether classic or contemporary, we have a design that is just right for you. Simply pick the style you want and team it with the fabric of your choice, and leave the rest to us. If you’re looking for Kings Road quality at high street prices, you’re in for a treat with our new collection. Every piece is handmade by craftsmen in the UK for you and your home. Please click on an image below to learn more about any chair. Once you see a chair you like, you can select a fabric from our Designer's Choice and then securely and quickly order on-line.